A glimpse inside the laboratories of the Institutes of Applied Production Sciences, Electronic Engineering, Automotive Engineering and Aviation. What happens here and who works on what? 2,100 visitors recently admired the impressive infrastructure of the Department of Engineering at FH JOANNEUM as part of the Long Night of Research. The laboratories are used for research projects and teaching, sometimes involving external project partners from business and industry. The findings from these projects are then integrated into teaching. The students actively take part in research projects and make use of the infrastructure for their Bachelor’s and Master’s theses. Kapfenberg is home to two facilities which are used for research and teaching at the Institute of Electronic Engineering. At the JOANNEUM Power Electronics Center, a Research Studio Austria supported by the FFG, the focus is on high-efficiency power electronics of the future. The aim is to minimise energy loss between the power station and the socket and to develop electronic components which are as small as possible and which can store energy over a long period of time. The Electromagnetic Anechoic Chamber is used for the measurement of interference emissions and immunity testing of electronic devices and offers the possibility of creating customer-specific antenna designs. The measurement frequency range extends from 30 megahertz to 18 gigahertz. Expansion of the laboratory is planned for the near future: an automated switch matrix, optical interfaces and a camera system for optical monitoring during ongoing testing will make the laboratory even more efficient. Mould and die construction for fibre composites, the use of composite materials, measurement tasks and research simulators mean nothing to the average person at first glance – but the facilities on offer at the Aeronautics Laboratory provide students and experts with the optimal infrastructure for research and teaching. There is even a research aircraft where measurements can be taken in the air. The laboratory is also the place where the joanneum Aeronautics student team prepare for the competitions. The FH JOANNEUM Testing Laboratory for Vehicles is recognised by the accreditation body of the Federal Ministry of Economic Affairs and Labour (BMWA). A total of 11 test beds are available both to external companies and for research and student projects. One such project is joanneum racing graz: Automotive Engineering students have been taking part in the Formula Student design competition since 2003. The Institutes of Dietetics and Nutrition, Midwifery and Applied Production Sciences make shared use of the Health Perception Lab. 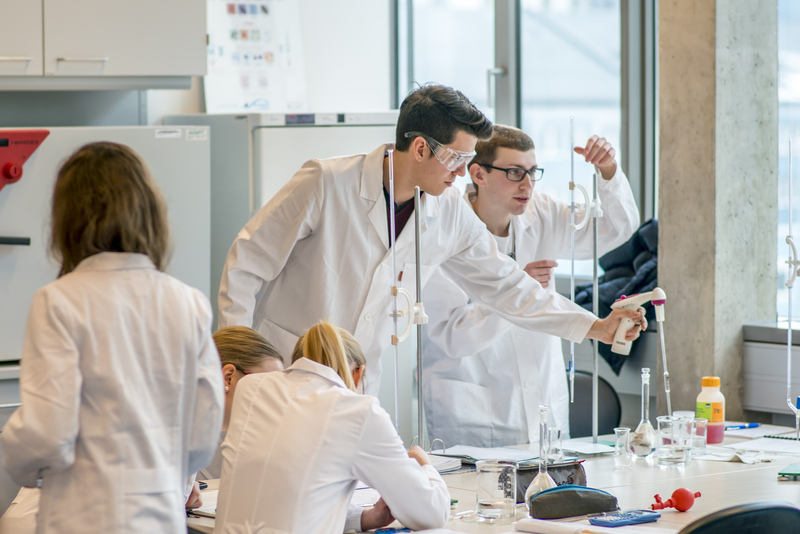 Students and employees of the Sustainable Food Management course teach and research in this sensory laboratory and the Laboratory for Chromatographic and Spectrometric Analysis, for example in relation to insects as a source of food. The Institute of Applied Production Sciences will be expanded in autumn 2018: the laboratories at Eckertstraße 7a will be opened in October or November, providing cutting-edge infrastructure for teaching, research, simulation and development on 920 m². The Institute of Biomedical Science will also make use of the new infrastructure.